When working at heights six feet and above, workers are at risk for serious injury if a fall occurs. According to OSHA, each year in the U.S. more than 200 construction workers are killed and over 10,000 are seriously injured by falls. When it comes to staying safe, proper planning, training and equipment are key. Plan how the job will get done, what tasks will be involved and what safety equipment is needed. Train workers in hazard recognition, the care of and safe use of scaffolding, fall protection systems and any other equipment they may use on the job. Provide the right equipment for the job at hand and ensure it is well maintained. From step to portable and fixed, ladders come in all shapes, sizes and materials. 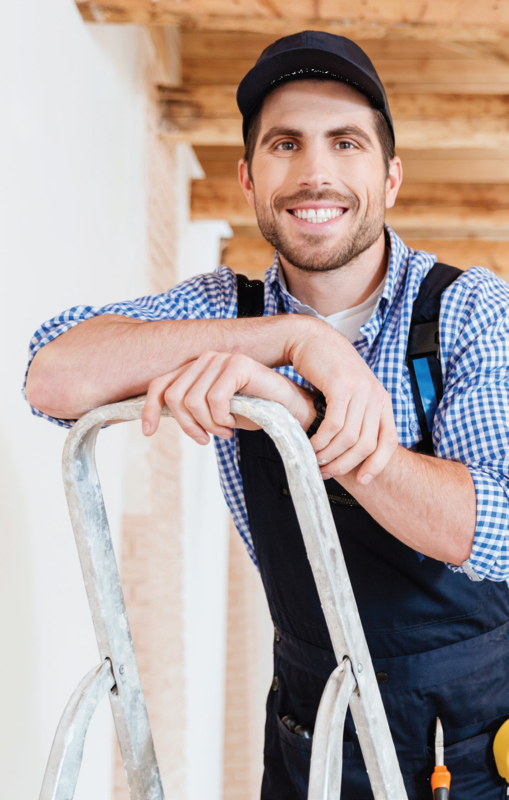 The good news is, the following safety tips apply to any type of ladder. Use the correct ladder for the job and visually inspect for any defects before use. Erect the ladder at the correct angle. Secure the ladder at the top. Ladders should extend a minimum of 36″ above the top landing. Avoid over-reaching by positioning the ladder close to your work. Protect the base of any ladder to prevent pedestrians or autos from bumping into it. Do not work off of ladders on uneven ground without securing the bottom of the ladder. Wear shoes with non-slip soles when working on a ladder. Face the ladder with your body centered between the rails when climbing up and down. Do not carry heavy or oversized items that could cause you to lose your balance. Keep the weather in mind, do not work on a ladder in strong storms or winds. Store ladders safely when not in use and at the end of the day. Workers should wear a personal fall arrest system to avoid possible injury when working at heights greater than six feet, such as rooftops, ladders and walls. Guard or cover all holes, openings and skylights. Construct all floor hole cover support two times the weight of employees, equipment and materials that may be imposed on them at any time. Scaffolding should be fully planked. Cover stairs with a no-slip surface such as rubber or slip-resistant paint. When you are on the stairs, do not carry heavy or large objects that require both hands or block your vision. Take only one step at a time and use the handrail.